Technology is meant to change people’s lives. Whether it turns out to be for better or for worse, it depends on how the technology is used. There are some gadgets that have changed the way we live our daily lives so strongly, however, that it is worth taking a look at them. Maybe, we can even take a minute or two to evaluate whether their integration into our lives has resulted in something positive or negative. If you are old enough, you will certainly remember the days when mobile phones were only seen rarely. Doctors, lawyers, and businessmen were usually the only ones who used them, and they were bulky as your winter comforter. And, all they could do was to make voice calls. Today, smartphones are the norm, with a brand and model to suit any budget. Smartphones have become so advanced and so affordable that they have become part and parcel of everyday life. From calls to text messages to voice messages to taking pictures and video to surfing the Internet – smartphones have definitely changed our lives. For good or bad? If you constantly hold your smartphone and choose not to interact face to face anymore, the you might want to do some thinking. You may not have used computers that took up the size of an entire room, but even the relatively modern desktop computers are still bulky. With the advent of the laptop, not to mention netbooks and ultrabooks, computing has become even more part of our daily routine. Just look at coffee shops and restaurants. It used to be that people interacted in groups, or buried their noses in books when alone. These days, more often than not, the laptop is one’s company. Even more disruptive than the laptop is the tablet. I think that for those who do “real” work when on the go, the laptop is the main gadget choice. However, if you only want to read, play games, or go online, the tablet is more convenient. And, with all sorts of tablets being available in the market, we are seeing them more and more when we go out. More people are becoming dependent on their tablets for companionship. The iPod is certainly not the only mp3 player that exists today, but this ingenious device has revolutionised the way we listen to music and even watch videos. Sure, the Walkman was there first, but with the iPod, we were able to carry along hundreds, even thousands, of music files. I wonder if the incidences of pedestrian accidents increased with the proliferation of the iPod? I remember always messing up the film using the good old 35mm camera. I remember having to wait for a day for the shop to develop and print the pictures, and the results were never guaranteed. With the digital camera – not to mention phone cameras – everyone has become a photographer. Of course, photography enthusiasts will sniff at the thought of certain camera models, but the fact is that the average person with no photography skills at all has more opportunities to record memories. Again, it can be good or bad. Up to you! In some countries, this does not exist, but for those who have been using the Tivo, you will probably agree with me that it has changed our lives so much. Forget the days of having to glue yourself to the TV to catch the latest episode of your favorite show, or the most important game of the season. Forget having to switch from channel to channel in an effort to watch two – or more – programs showing at the same time. 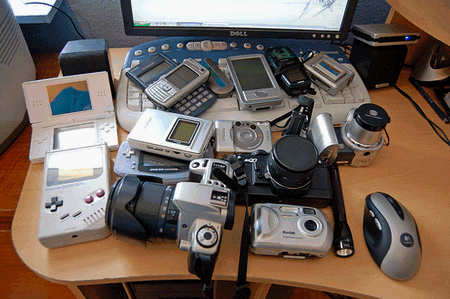 Do you have other gadgets to add to this list?